4 More Arrests Made by MCB BRTF in the Fight Against Residential "Knock-Knock" Type Burglaries. Were you a Victim too? Detectives from the Los Angeles County Sheriff’s Department’s, Major Crimes Bureau, Burglary-Robbery Task Force (BRTF) believe there are additional victims in recent Los Angeles and Orange County residential “Knock-Knock” type burglaries. They have arrested four suspects and want you to contact them, or your local law enforcement agency, if you believe these suspects burglarized your home. The arrests were made after detectives observed four suspects commit a residential burglary in North Hollywood, on Thursday, July 26, 2018, at approximately 1:15 p.m. They saw the suspects, who were in a silver Infiniti G35 sedan, driving slowly through neighborhoods in the Santa Clarita Valley and into the North Hollywood area. Eventually they watched as three suspects exited their vehicle and ultimately burglarize a home on 6500 block of Beeman Avenue. Then, the three suspects emerge from the rear yard of the residence and quickly walked a short distance to their waiting vehicle. As this transpired, BRTF Investigators coordinated with officers from the Los Angeles Police Department’s (LAPD) North Hollywood Division, who were responding to assist. As the suspects began to enter their vehicle, BRTF Investigators along with LAPD Officers initiated a high risk detention of the suspects and their vehicle. Two adults and two juveniles were detained inside the vehicle. Stolen property, valued in excess of $10,000 was recovered within the vehicle. The recovered stolen property was confirmed to be stolen from the residence where the suspects were seen leaving. The suspects were arrested and transported to LAPD North Hollywood Division Jail to be booked. 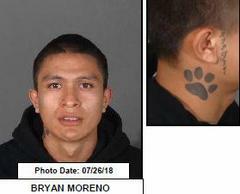 Suspect Bryan Moreno, male Hispanic 18 years-old and resident of Los Angeles, was booked on charges of Residential Burglary (459 PC), and subsequently released on a $50,000 bond. Additionally, at the time of his arrest he was out on bond from a recent Orange County residential burglary arrest. 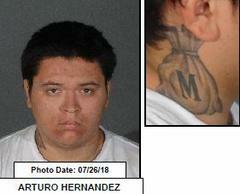 Suspect Arturo Hernandez, male Hispanic 18years-old and resident of Long Beach, was booked on charges of Residential Burglary (459 PC), and subsequently released on a $50,000 bond. The juvenile subjects, a male Hispanic 17 years-old and a male Black 17 years-old, were detained and released pending juvenile court proceedings. LAPD North Hollywood detectives, in cooperation with LASD BRTF Detectives, are handling the criminal filing and ongoing investigation of this burglary crew. With assistance from LAPD Detectives, Sheriff Detectives will determine if these suspects were involved in recent residential burglaries occurring in the Los Angeles and Orange County areas. Residents should call 9-1-1 if a life threatening emergency is detected and/or their local police business line, if a suspicious person or vehicle is observed. The MCB BRTF can be contacted via e-mail at BRTF@LASD.org for tips, questions, or concerns. The investigation and arrest of this residential burglary crew is an example of the ongoing cooperation and collaboration between the LASD and LAPD as each agency is committed to impacting the Southern California wide residential burglary epidemic. The LASD Major Crimes BRTF works closely and consistently with LAPD Detectives, North Hollywood Division in particular, in its mission to identify, investigate, and arrest organized burglary and robbery suspects. The LASD MCB BRTF was formed over eight years ago to combat the ever increasing trend of organized crews who are committing daytime residential burglaries.Typically known as “Knock-Knock” burglars, these crews, often formed by gang members, utilize high-end luxury vehicles to blend into middle class and affluent neighborhoods where they break into homes and businesses, ransacking and stealing valuables such as cash, jewelry, and weapons. The MCB BRTF works closely in support of all LASD Station’s detective bureaus, as well as other Southern California law enforcement agencies.Residents and business owners are reminded to secure their properties, be aware of suspicious and unusual persons or vehicles, and to alert their local law enforcement immediately if suspicious activity is observed.